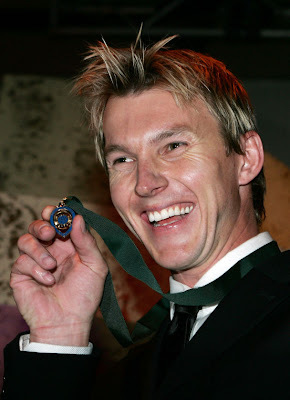 Brett Lee won the Allan Border Medal for 2008. He didn't look very surprised, but I'm sure that's the fault of the Botox. I know that "I'm incredibly pleased and proud of myself, but I can't move my face" look anywhere. He thanked his wife (who has a sore back - care factor? ), his son (what the hell did he do? Bat for him in the nets? ), his teammates, staff. Short and sweet acceptance speech, just as it should be. When interviewed by Mark Nicholas he talked about his Bollywood career, his love of India, his commitment to his family, and his childhood idols Dennis Lillee and his brother Shane. His wife Liz didn't smile very much. Maybe the orange glow of her skin was reflecting in her eyes and distracting her. He scored 125 votes, significantly more than Matthew Hayden in second place. And that's over for another year. Back to the cricket. Back to reality. EDIT: Tell me it's not true! Looks like Lee has been taking pruning tips from that bloke in "There's Something About Mary". Ah, there's nothing like making reference to 1990s teen-flicks. Hmm..interesting article. I admire this bloke and he's perhaps one of my absolute favorites. Its not Brett Lee's fault that he is a talented player and incredibly good looking! Leave him alone - he is gorgeous! Oh, and a large amount of his votes came from umpires and the media. This indicates that he plays the game in the right spirit and always does us proud. Anonymous, good to see another female reader about the place. Rest assured, I too appreciate Binga's fine features, but c'mon look at those eyes. There's Botox there, there has to be! I think it's great he won. He went through a rough stage a few years ago, it just goes to show that it's always possible to make a wondrous comeback. anonymous, are you Brett Lee? I have often wondered why is Bret Lee not talked about as a captain. He is by far a clear personal favourite opposition player across all of India's opponents. His growth as a player, bowler, media guy, frontline weapon has been fascinating. His battles with Sachin are better than with Sachin's and McGrath's. He is overall a class act. Even with all the ugliness from the Monkey and Weed episodes he is one guy whom I continue to admire from the current Aussie team. I agree totally miss-field! No one who spends their life in the sun has a face that smooth! No one!